Vitamin B₁₂ is an essential vitamin that performs many important functions in the body. It is exclusively formed by microorganisms and must be ingested through food or dietary supplements. ProVeg explains how vegans and vegetarians can protect themselves against a shortage of vitamin B₁₂. A lack of cobalamin leads to disturbances in cell division across the entire body. This mainly affects the formation of red blood cells, but also impacts on the oral and pharyngeal mucosa, as well as on the nervous system. A typical symptom of vitamin B12 deficiency is a form of anaemia which causes the red blood cells to become abnormally enlarged (megaloblastic anaemia). Characteristic signs include pale skin and mucous membranes and the regression of oral, tongue, and intestinal mucosa, as well as the subsequent impairment of nutrient uptake, along with non-specific symptoms such as general weakness, rapid fatigue, and dizziness.9Biesalski, H. K. et al. (2017): Taschenatlas Ernährung. Georg Thieme Verlag p.201 10Truswell, A. S. (2007): Vitamin B12. Nutrition & Dietetics. 64, S120–S125. Available at http://onlinelibrary.wiley.com/doi/10.1111/j.1747-0080.2007.00198.x/epdf [07.03.2018] An insufficient supply of vitamin B12 also leads to increased blood concentrations of homocysteine, which represents a risk factor for the development of atherosclerosis and cardiovascular diseases. The second set of symptoms caused by a deficiency in cobalamin is even more serious. These include damage to the central nervous system, which can manifest itself as sensory disorders (such as the feeling of ‘pins and needles’ in hands, feet, and other parts of the body), a lack of appetite, delayed reflexes, and reduced motor abilities, as well as impairments in movement coordination. Mental disorders, ranging from confusion or memory problems to psychoses and hallucinations, can also be signs of vitamin B12 deficiency.11Fenech, M. (2012): Folate (vitamin B9) and vitamin B12 and their function in the maintenance of nuclear and mitochondrial genome integrity. Mutation Research/Fundamental and Molecular Mechanisms of Mutagenesis. 733, p.21–33 12Mischoulon D1, Fava M. (2002): Role of S-adenosyl-L-methionine in the treatment of depression: a review of the evidence. D.Mischoulon, M.Fava. Am J Clin Nutr. 76 Available at http://www.ncbi.nlm.nih.gov/pubmed/12420702 [05.03.2018] Both sets of symptoms can occur independently of each other. 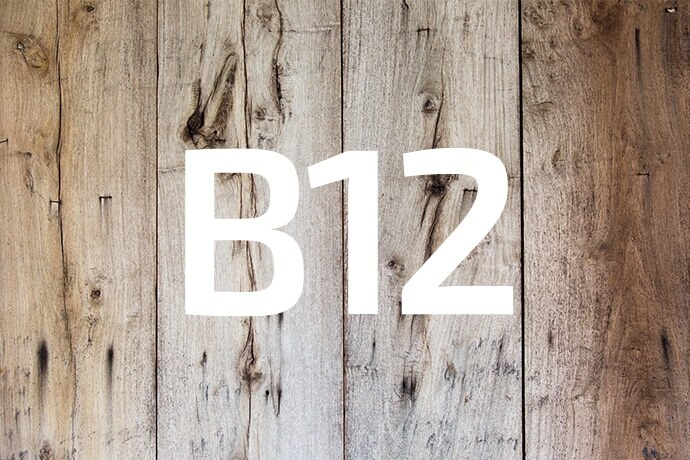 The major risk groups for vitamin B12 deficiency are vegans (and some vegetarians), the elderly,26Obeid R, Schorr H, Eckert R, Herrmann W. (2004): Vitamin B12 status in the elderly as judged by available biochemical markers. Available at https://www.ncbi.nlm.nih.gov/pubmed/14709663 [21.03.2018] people with gastrointestinal diseases, and pregnant and nursing women – as well as alcoholics and smokers. Thus, when following a vegan/vegetarian diet, a sufficient supply of vitamin B12 should be ensured through fortified foods and dietary supplements in the form of, for example, tablets, drops, or vitamin B12 toothpaste. Pregnant and breastfeeding women should pay particular attention to consuming an adequate quantity of vitamin B12 in order to ensure that their children receive a sufficient supply. The use of multivitamins is not recommended since vitamin B12 can break down in the presence of vitamin C and copper. However, stand-alone vitamin B12 supplements can be highly effective. According to studies, there is no significant difference between a sublingual or oral intake of vitamin B12.42Sharabi, A. et al. (2003): Replacement therapy for vitamin B12 deficiency: comparison between the sublingual and oral route: Sublingual vs. oral vitamin B12 replacement. British Journal of Clinical Pharmacology. 56, p.635–638 43Yazaki, Y. et al. (2006): A Single-Center, Double-Blinded, Randomized Controlled Study to Evaluate the Relative Efficacy of Sublingual and Oral Vitamin B-Complex Administration in Reducing Total Serum Homocysteine Levels The respective absorption rates for doses of 50 micrograms, 200 micrograms, and 1000 micrograms are approximately 1.5 micrograms, 3.5 micrograms, and 11.5 micrograms (see section on vitamin B12 intake). In most countries, intramuscular injections have long been the standard treatment for vitamin B12 deficiency. However, recent studies show no significant difference between oral or intramuscular vitamin B12 intake.45Josep Vidal-Alaball, Christopher Butler, Rebecca Cannings-John, Andrew Goringe, Kerry Hood, Andrew McCaddon, Ian McDowell, Alexandra Papaioannou (2005): Oral vitamin B12 versus intramuscular vitamin B12 for vitamin B12 deficiency. Available at https://www.ncbi.nlm.nih.gov/pmc/articles/PMC5112015/ [21.03.2018] In patients suffering from pernicious anaemia (an autoimmune disease), intramuscular injection is the most efficient form of supplementation. Vegans and vegetarians should have their vitamin B12 levels checked regularly. People following a vegan diet should regularly take dietary supplements in order to ensure an adequate supply of vitamin B12. To determine a suitable dosage, both vitamin B12 requirements and the dose of the supplement must both be taken into account.